There's a blue and pumping vein of individualism that has run through the artistic movements that have left their mark most clearly on our culture. The Renaissance presented the objective truth of the individual at the centre of art it gave bodies the dignity of singularity. Abstract Expressionists claimed the ultimate ascendancy of the individual's interior world and painted its mucky birthing into the external. Romanticism bloomed with the celebration of subjectivity, our selves governed the world as we experienced it and its meaning comes from how we see it. 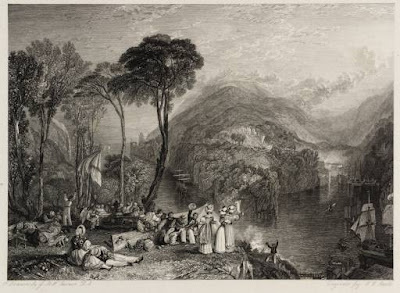 At the Art Gallery of New South Wales's exhibition 'Printmaking in the Age of Romanticism' we see how a subjective view of the world, where the land and the elements become expressions of our inner selves, was also an attempt to make sense of life in an uncertain world. Nature looms large (and there is always an awful lot of looming in Turner) and another key theme here is the romantic longing for the pastoral. 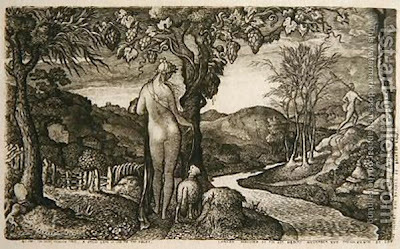 William Blake uses Virgil's pastoral's as jumping off points for a series of minute stylized wood engravings that present a very English paradise. Edward Calvert's series of tiny jewel like images hark back to a mythical England, a pre-lapsarian innocence. 'The Chamber Idyll' is sgriking in its modesty and guileless eroticism. Framed by beams that almost provide a proscenium there is a tremendous sense of voyeurism as we see a woman undress for her lover, around are symbols of passion and fecundity. This small exquisitely engraved piece is worth the visit alone. 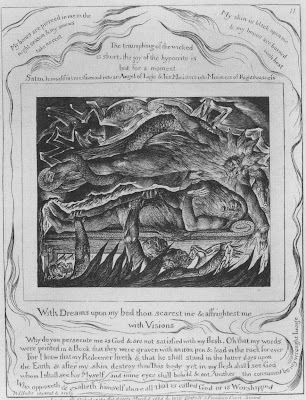 The work of William Blake is always at least fascinating. His line filled figures are like El Greco's, pure spirit captured in flesh whilst, even if his personal symbology is opaque to viewers today, its drama is undeniable. The selections hear from 'The Book of Job' represent him perfectly, bordered with text, some biblical, some his own composition they show an absolutely vital spiritual ques, a negotiation between the Old Testament and a personal visionary mythology. 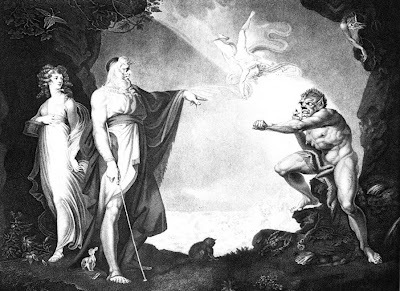 Job's story is of faith and patience in the face of Satan, this is a strong point of identification for Blake and the personal gives these enormous power. 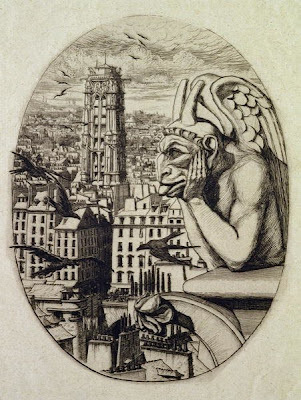 What is most striking here is Blake's technique, eschewing stippling or shading he works in pure line and this gives a dynamism that almost makes the paper twist and clench. There is evidence of both the literary and the fantastic throughout the exhibition. 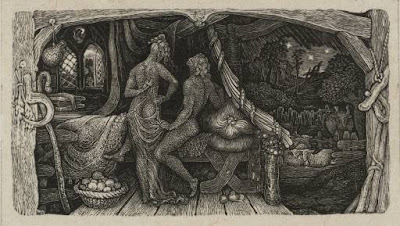 These prints are often narrative, taking their subjects from the Pantheon of English literature Chaucer, Shakespeare and Milton. These often feel like the most dated and least compelling work (although we ought to remember that their narrative function means that success or otherwise can be achieved through different criteria than those we apply today). Fuseli's grotesqueries look like English literature's greatest hits. In rendering Shakespeare and Milton so vividly he renders it literal, and as a result it looks one dimensional, there are also oddly jarring moments, like the hilariously English looking Miranda in his Tempest picture His paintings, with their smokey blackness hide, and subsequently provoke, more. The Miltonian work of John Martin is similarly dramatic whilst being oddly unmoving. His hell looks like one designed by Albert Speer (and his Babylon cold be a collaboration between DW Griffith and Saddam Hussein) and the sheer blackness of the work shows us why we think of dark as inky. The problem with the deployment of typically romantic technique in these literal contexts is the loss of the power of suggestion, subsequently Fuseli and Martin feel like curiosities. One of the most enjoyable parts of the show is the presentation of Turner's prints in their different states, in particular 'Dartmouth Cove' this is less of technical interest but a powerful example of the romantic ethic. The twin states of Turner's pastoral landscapes, in particular are an illustration of both technique and meaning. In the earlier etching his lines are crisp and descriptive, in the second state he applies a layer of darkness, that comes over like the dark forebodings of a coastal storm. It is more than meteorological, the darkness takes is a layer of meaning, the picnickers are threatened, Turner feels and sees turmoil. This is how landscape becomes personal and symbolic. Print is a comparatively egalitarian art form, these images here could be disseminated widely and would have an enormous impact on visual culture. It is important to remember that so many of the artists of the period were politically committed and active and often the romantic themes of the historic and the pastoral were intrinsically linked to calls for natural justice to be restored or declarations of the dignity of working people. This political expression is most clearly visible in the endlessly inventive satires of Honoré Daumier. 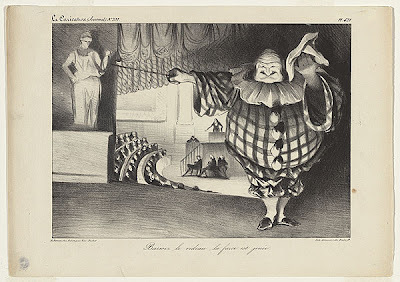 In the lithograph 'Bring Down The Curtain this Farce is Over' a Comédie Francaise clown is about to put and end to a parliamentary sitting. It's worth remembering when contemporary artists talk about transgression that in Paris in 1834 sedition was life-threatening and this period was bookended by two revolutions. The exhibition is composed of French and English artists, which form the gallery's holdings this is a shame that the scope could not have been expanded with loans, the contrast between this present and German artists would have been interesting. Of course the one of the greatest artists of the period also was the supreme printmaker and it would have been a coup to bring in Goya's tortured, wry and pessimistic Spanish Romanticism into the mix. However there is extraordinary work here and it allows us to see how a movement developed in response to a changing world and used the resources of history and nature to try to assert man's place, it's a good story.